With so many names being bandied about before the trade deadline, no one know who will be the next domino to fall. One name that could be moved sooner than later will be New Jersey Devils winger Marcus Johansson, who according to TSN’s Pierre LeBrun, has generated quite a bit of interest in the last couple of days. Johansson, who was featured by Pro Hockey Rumors as a trade candidate here, was a key player for the Washington Capitals over the years, but the team traded him away the year before they won the Stanley Cup Finals. He’s struggled with injuries since arriving in New Jersey in 2017, scoring just five goals and 14 points last year in just 29 games. He has fared a little better this year as he has 11 goals and 25 point in 46 games, but the 28-year-old has been heating up more recently. He has scored five goals and 10 points in his last 11 games and could provide a team with a solid rental player for a playoff run. LeBrun adds that Johansson has a five-team no-trade list, but none of the teams on his list are teams that would be interested in trading for him. A trade could come quickly as New Jersey general manager Ray Shero is well known to make his trades long before the trade deadline. The team has already moved Brian Boyle. New York Islanders general manager Lou Lamoriello said he’d be fine if the Islanders stand pat at the trade deadline despite having plenty of prospects, picks and pending unrestricted free agents it could deal if needed, according to Newsday’s Andrew Gross. “I am very comfortable with this hockey team,” Lamoriello said. “Our coaching staff has done an outstanding job and the players have done an outstanding job buying into what’s been asked. You have to be very, very careful. 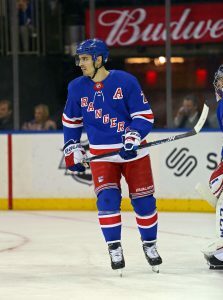 There are so many factors involved, whether it’s the chemistry of your team, needs and making sure that it doesn’t get in the way of what’s transpiring.” Of course, Lamoriello is known to be secretive in nature, however, and could easily pull off the biggest surprise at the trade deadline as he’s has been known to do when with both Toronto and New Jersey.